Very quick and easy purchase, what can you say but it was what I wanted at a decent price and delivered to my door. 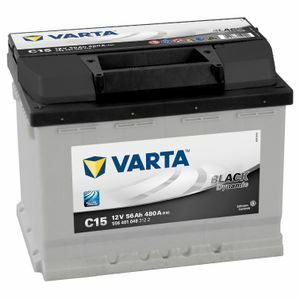 This battery is perfect for all classic VW vans that have the positive terminal on the left hand side. Easily fitted and secured. Excellent delivery service and battery replaces the original within the tray fitment. Note that the original battery jacket and retaining clamp couldn't be re-used. The new battery is slightly bigger and higher. I made up a new restraining clamp using the original upright bolts but a clamp may not be necessary anyway. Performance and life is better than the original battery. Good service, fast delivery will definitely use company again. Excellent prices and delivery - no faults from me. Battery fitted well on battery tray. Well suited to car, even though it was possible to fit a larger battery. Note: larger battery is normal for TVR's that have a V8, but mine is a V6 and there was no point putting a larger and heavier battery in. Also, most importantly, this battery is maintenance free which I feel is essential for a TVR. No one was checking my previous battery at the service intervals, and this led to its demise!!! Great deal and lightening delivery! Very helpful when contacted regarding type of battery required.